Borneo Malaysia consists of two states, Sabah and Sarawak as well as the federal territory of Labuan situated on an island off the coast of Borneo. 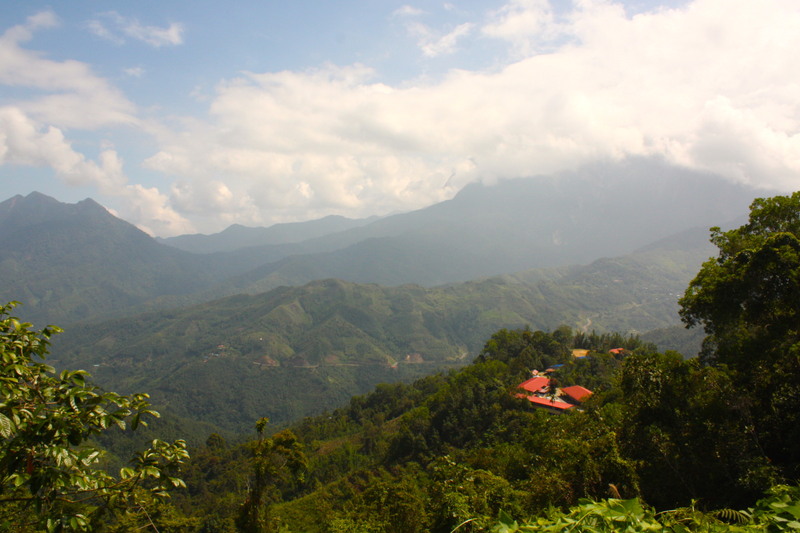 I visited the state of Sabah as I only gave myself two weeks in Borneo. Borneo was a country I was intrigued about but never thought I would visit. I must have considered it at the beginning of my travels but assumed as I had not had any malaria tablets it was not a place I would end up in. However, after just simply going for it, I imagined myself entering a country that was completely full of wildlife and although it is, the city is not what I had read about. Some visitors described the city as not having much to offer so I assumed it would be more like a town. When I got to Kota Kinabalu I ended up staying in a single room where there was karaoke playing every night. I began waking up to Colbie Caillats song, Try in my head as that was a keen favourite. It was a far cry from the tranquil, natural environment I ignorantly presumed it would be. It was refreshing to see how my perspective of this country changed in an instant. This is what I love about travelling the most, the feeling of newness, the awe of what you get to see, the way each country surprises me and fulfills a yearning to learn more about the environment, culture and life of each country and a wonderful way to make life varied and exciting. What to do in Borneo Malaysia? KK is the city of Sabah which is a state in Borneo Malaysia. KK City Mosque is known as the floating mosque. Durian is loved in South East Asia…not something I could eat. Mangosteen was one of my favourites! I love leaves so this giant one blew me away. Rafflesia!!!! The worlds largest bloom! A parasitic flowering plant that is rare to see. This may well be one of my favourite act of kindness that I experienced. I met a kind hearted young lady when I went to buy myself some make up (ahem…you’d be surprised what sort of kick I get out of a different shade of lipstick). We clicked straight away and bonded while she tried on different products on my face. She asked if I wanted to have lunch with her and convinced me to stay in KK for one more day. She wanted to take me around the city on her day off! I felt like I made a sister in a day! We met the next day with her twin brother. They were absolutely sweet and made me feel like I had gained a new family. On that day we met for breakfast, had lunch, went to the cinema, had dinner and drinks. I honestly could not have thanked them for a more enjoyable stay in KK. As if treating me was not enough her brother picked me up the next morning to take me to the airport. He handed me a sim card he had just bought me and insisted I take it so that I could at least be reachable because where I was staying there would be no wifi. Honestly, this was a God send as I needed to use my phone to contact the host and it gave me some sort of security. This is more than a random act of kindness but an expression of loving others. It really made my stay in Borneo even more memorable. Thank you Jojo and Jo. Remember you are welcome to stay with me. I hope I can return your generosity in some way. The island I got to see was called Mantanani. It was very beautiful and thinking back to it reminds me of the Philippines. So much beauty with a lot of potential. A whole family entertaining me! Just me, my host and the jungle. Pygmy Elephants cleaning themselves and swimming across the river. My host told me I was lucky to see Pygmy Elephants as it is a rare sight. I went to the Jungle in Borneo and the one thing that made me overwhelmed were these beautiful nests. It was magical. Borneo’s jungle is spectacular. It will give you serenity, simplicity and of course nature in it’s natural state. While at Kinabatanga river I felt I had fulfilled a little of my childhood fantasy of being an ‘explorer’, ‘naturalist’ or like the legend, David Attenborough in real life. Of course I was non of these but just a wanderer seeking many moments of awe. Check my next blog post as this will continue with my love for Borneo and touch on an important issue!